I have a Russian friend who owns a set of nesting dolls. These dolls are wooden shells with other dolls nested inside. They are brightly painted with lots of details. On the outside is a large old woman, called the Babooshka. Within here are other dolls, male and female, that represent a family of dolls. Inside the last doll is a small baby doll that doesn’t open. These dolls are something she cherishes. The Babooshka represents her Grandmother, a woman who cared for her and loved her so deeply. Each doll inside she has named to be another member of her family. As I looked at the dolls I noticed some have hands, and some don’t. The ones that do have hands have them painted on and simply touching the side of their garment. They’re not holding anything, not carrying anything. In America when we think of family, we think of the father as the provider, the children doing chores, and the mother cooking dinner. But in my friend’s culture, family is love first, and duty second. In John 14 Jesus is explaining to his disciples that He will soon leave them. He says He will not leave them “orphans” because He will send the Holy Spirit to comfort them. In verse 20 He says “On that day you will realize that I am in my Father, and you are in me, and I am in you.” The metaphor in this statement reminds me of those nesting dolls. God the Father is the larger outside doll with Jesus inside of Him. In John 14:31 Jesus says that God is greater than He is, and He does the will of His father who sent him. We are inside Jesus. John 15:6-9 says that if we abide in Jesus, we can ask whatever we desire and it will be given us. He becomes our provider too. If we abide in Jesus we abide in His love for us – a love without condition. It also says that if we do not abide in him, we will be cast out as a withered vine, and burned. Within us lies the last of the nesting dolls – the Holy Spirit, our Comforter and Guide. This is where the analogy of the nesting dolls breaks down. 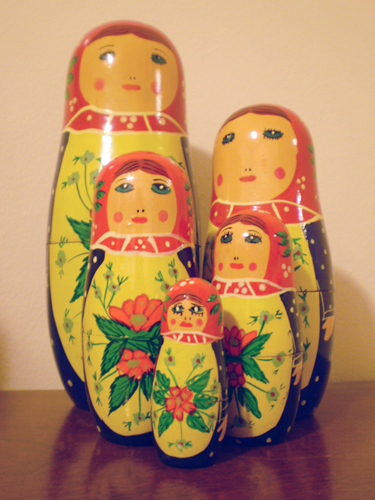 In the nesting doll family, each member is stronger than the inward member. But the Holy Spirit is our strength. He is greater, yet has been given as a gift to us by God the Father. The Holy Spirit is our power (Acts1:8), our comforter (Acts 9:31), our guide (John 14:26), the spirit of truth (John 14:17), the giver of our spiritual gifts (Hebrews 2:4), our seal (Ephesians 1:13), and our connection to the love of God (Romans 5:5). Isn’t it good to know that we are covered in such strong layers of power as our Father God, our Lord Jesus, and even on this earth abide with the Holy Spirit? Father, I praise you for you have created in and around me a great power. You are the lifter of my head, and the love that abides in me. How wonderful you are and how wonderful your creations! Thank you Father that you have found us worthy of such lavish affection. Thank you Lord Jesus that you did not abandon us, but sent your Holy Spirit to abide with us in a world where we are continually persecuted. Thank you that all the power we need is ours through faith. Amen.